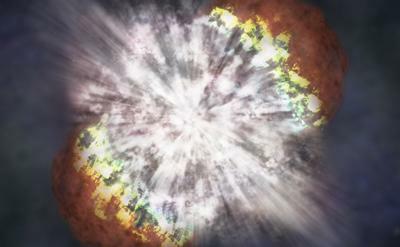 An international team of astronomers led by the University of Southampton has confirmed the discovery of the most distant supernova ever detected – a huge cosmic explosion that took place 10.5 billion years ago, or three-quarters the age of the Universe itself. Lead author of the study Dr Mathew Smith, of the University of Southampton, said: “It’s thrilling to be part of the survey that has discovered the oldest known supernova. DES16C2nm is extremely distant, extremely bright, and extremely rare – not the sort of thing you stumble across every day as an astronomer. “As well as being a very exciting discovery in its own right, the extreme distance of DES16C2nm gives us a unique insight into the nature of SLSN. Study co-author Professor Mark Sullivan, also of the University of Southampton, said: “Finding more distant events, to determine the variety and sheer number of these events, is the next step. DES16C2nm was first detected in August 2016, and its distance and extreme brightness confirmed in October that year using three of the world’s most powerful telescopes – the Very Large Telescope and the Magellan, in Chile, and the Keck Observatory, in Hawaii.